Thirty-four participants walked a combined total of 86 miles and raised $2,417 to help find a cure for Alzheimer’s disease. Overcast skies and occasional light rain didn’t hamper their efforts, or fun, at the Memory Walk held at the senior citizens’ center in Lovell. This is the ninth consecutive year the event has been held at the center. The Tippetts family raised more than $850 to help find a cure for Alzheimer’s disease. 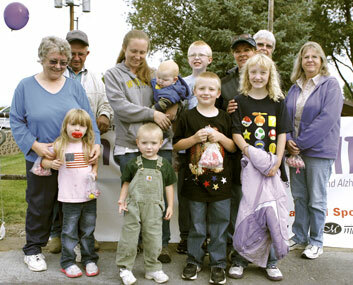 Pictured above: Bud Harrison, Ben Cornia, Loretta Tippetts, Kathy Harrison, Mary Cornia, Sam Cornia, Cherie Trautman, JoAnn Knopp, Hally Cornia, Nate Cornia, Baby Mike Cornia and Megan Cornia. Absent this year were Shelly Lohof and Cori Thompson who were walking 20 miles per day for three days in the Susan B. Komen walk for breast cancer research. Alzheimer’s is a disease that robs those afflicted of past, present and future memories. In the more advanced stages, it robs them of their independence by taking away their ability to perform the most common, everyday tasks, like turning off the stove or putting on their shoes. Denise Andersen, Director of the North Big Horn County Senior Center, organized the event. She thought it most appropriate that the center sponsor the walk since the disease often affects the elderly. This year’s walk featured some new twists. Organizers included a few interesting diversions to break up the monotony of walking around a track, including poker laps, kazoo laps, lip laps and bounce the ball laps. There was also a sneaker toss this year where participants tossed one of their own shoes off the end of their foot to see who could toss the greatest distance. Patricia Johnson won a beautiful handmade quilt in a raffle. The Tippetts family raised more than $850 through their participation. As many as 15 members of the family compete every year to help raise money for the cause. This year 12 participated. The youngest family member walking was only 3 years old. And an even younger family member was pushed in a stroller over the course.